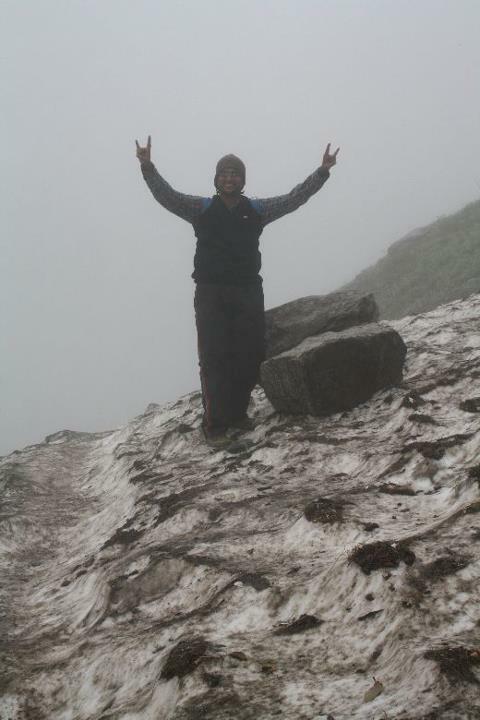 One of the most fascinating things about the Himalayas is the cold and firm Glaciers that you encounter on the route. Most cases, these glaciers are broken off, fallen from the top of a pass or covered atop a flowing mass of heavy water! Well, what’s more adventurous is when you actually have to walk the thin lines, no pun intended, and cross the terrains in order to get to where you have to. While getting a real good grip on the glaciers is sometimes quite the challenge, the feeling of the pounding heart to set the right footing ahead gives you an adrenaline rush to make sure that you don’t lose your foot and tumble off into the valley or the water flowing below! A feeling that you cannot imagine anywhere else, even on the world’s toughest and scariest bridges. 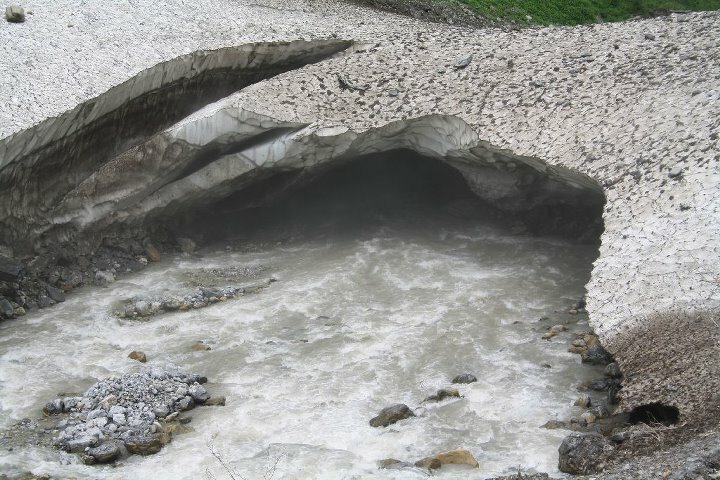 A glacier covered over a stream of flowing water is no less than one of those bridges themselves! 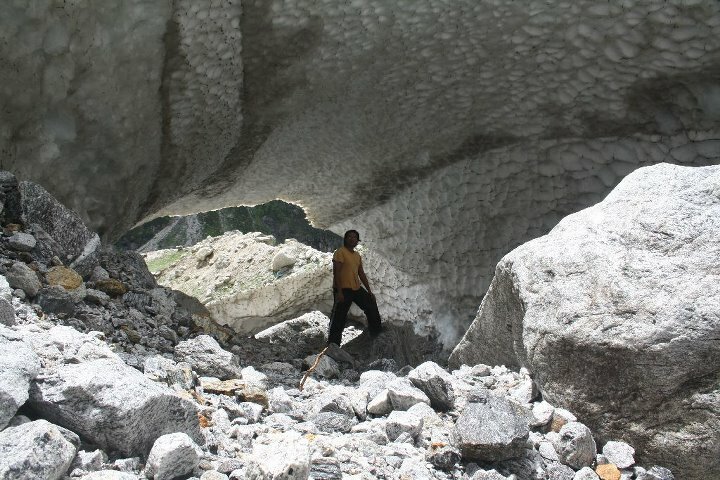 Another really amazing experience I’ve had was when the glaciers formed a cave at the foothills of Vasudhara waterfalls across the Indo-Tibet border in Western Himalayas. As soon as you stand beneath the glacier, you’d probably feel that you’re in one of those cold storages, minus the smell of the meat! 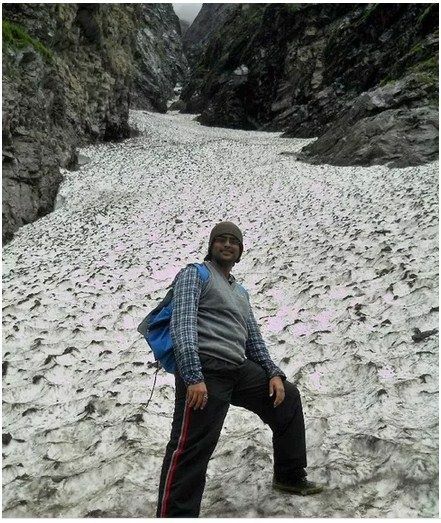 One of the best feelings I’ve had ever was when I dozed off for over an hour after a 10 km trek at the foothills of Vasudhara falls beneath this Glacier cave. Truly spectacular! To top it off, if you find a melting glacier across the mountains, make sure you collect the water from that glacier in your sipper and drink the rejuvenating and fresh cold stream of life as you would imagine. Tastes like no other water you have ever had! One of the most enchanting feelings about these bodies is how smartly nature works it’s ways and makes sure that there’s enough room against the water body so as to ensure that people or animals can walk by and there’s enough weight, strength and firmness that unless there’s an extreme situation all works out just about right. The mix of the thrill and the adrenaline along with the feeling of refreshing company of the natural wonders make you think about how the universe has subdued itself to blend in to whatever is as natural as it can be. What do you think? 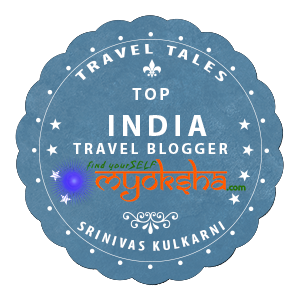 This entry was posted in North, Tales from Himalaya and tagged Hemkund Sahib, Himalayas, Mana Village, Uttarakhand, Valley of Flowers, Vasudhara falls on August 12, 2014 by srinistuff.